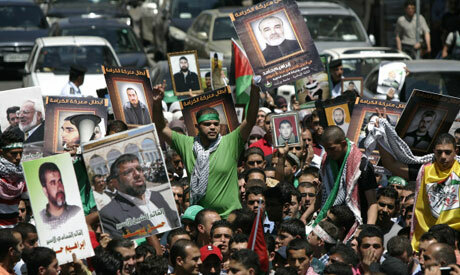 Palestinians held photographs of prisoners jailed in Israel during a support rally for Palestinian prisoners who were on hunger strike last Friday, (Photo: AP). Two Palestinian prisoners in Israeli jails are refusing food, despite the signing this week of a deal to end a mass prisoner hunger strike, Israeli and Palestinian officials said on Thursday. An official from the Palestinian Prisoners' Club, which tracks the well-being of the 4,700 Palestinians in Israeli jails, told AFP that "prisoners Mahmud Sarsak and Akram Rikhawi are still on hunger strike." The official, who spoke on condition of anonymity, said both prisoners had never stopped their protest, even after prisoner leaders on Monday accepted a package of Israeli measures easing conditions in exchange for the end of a mass hunger strike that had grown to include about 1,550 detainees. Israel Prisons Services spokeswoman Sivan Weizman confirmed Sarsak and Rikhawi were refusing food, but said they had briefly stopped their hunger strikes on Monday, before resuming them on Tuesday. "They ate on Monday night with the rest of the prisoners who ended their hunger strike," she told AFP. "The prisoners then declared that they want to continue their hunger strike." "Both are under medical supervision in the prison clinic in Ramle, near Tel Aviv, and in good condition." Weizman said Sarsak began refusing food on April 4, and was calling on Israel to recognise him as a prisoner of war. Rikhawi is protesting his jailing without charge under an administrative detention order, which is issued by a military court and allows Israel to hold detainees without trial for renewable periods of six months. The use of administrative detention was a key inspiration for the mass hunger strike that swept through the Palestinian population in Israeli jails in recent months. Early this year, prisoner Khader Adnan drew international attention by refusing food for 66 days to protest his administrative detention, eventually winning a deal under which Israel agreed not to renew his detention order. He was followed by Hanaa Shalabi, who refused food for 43 days to protest her imprisonment without charge. She agreed to a deal under which Israel deported her from the West Bank to Gaza, where she must remain for three years. Other prisoners who began refusing food alongside Shalabi continued their hunger strike, and they were joined by hundreds more in April, prompting international organisations and foreign governments to express concern. The Egyptian-mediated deal announced Monday saw the prisoner leadership agree to end the strike in exchange for a package of measures, including visits from relatives in Gaza, and the transfer of detainees out of solitary confinement.